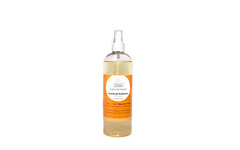 Organic and Nature's Natural Air Freshener refreshes and invigorates areas by removing bad odors while replacing them with a delightful, natural fragrance. Organic Lemon oil has antiseptic properties as well as an uplifting aroma. Why bring toxins into your home? This natural formula contains no Volatile Organic Compounds (VOC's) and is safe for use around people and pets. Ingredients: Natural surfactants, natural spring water, and organic lemon oil. Natural Air Freshener contains no animal byproducts. This product was formulated from the latest and safest natural technologies available and contains no solvents, sulfates, glycols, or phthalates.